English Actor Peter Davison (born Peter Malcolm Gordon Moffett was born 13 April 1955, he is best known for his roles as Tristan Farnon in the television version of James Herriot’s All Creatures Great and Small, and as the fifth incarnation of the Doctor in Doctor Who, which he played from 1981 to 1984.Also, he played David Braithwaite in At Home with the Braithwaites. Since 2011 he has been playing Henry Sharpe in Law & Order: UK. Davison studied at the Central School of Speech and Drama. His first job was at the Nottingham Playhouse.He chose the stage name Peter Davison to avoid confusion with the actor and director Peter Moffatt, with whom Davison later worked.In 1973, aged 21, Davison married Diane Russell.His first television work was in a 1975 episode of the children’s science fiction television programme The Tomorrow People, alongside American actress Sandra Dickinson, whom he married on 26 December 1978. Davison portrayed an alien named “Elmer”, who arrives on Earth along with his sister (played by Dickinson) and his mother, known as “the Mama” (played by Margaret Burton).In the mid-1970s, during a lull in his acting career, Davison spent 18 months working in a tax office in Twickenham.In 1976, he was offered a prominent role in the 13-segment TV miniseries Love for Lydia opposite a young Jeremy Irons; the series was broadcast on ITV the following year. In 1978, Davison’s performance as the youthfully mischievous Tristan Farnon in All Creatures Great and Small made him a household name. Davison has said that he was mainly cast in the role because he looked as if he could be Robert Hardy’s younger brother. Davison and his wife composed and performed the theme tunes to Button Moon, a children’s programme broadcast in the 1980s, and Mixed Blessings, a sit-com broadcast on ITV in 1978. Davison subsequently appeared alongside Dickinson as the Dish of the Day in the television version of The Hitchhiker’s Guide to the Galaxy (1981), whose producers considered it humorous for an actor known for playing a veterinary surgeon to appear as a cow. The couple had a daughter, Georgia Moffett, in 1984, but later divorced in 1994. Davison has also appeared in several British sitcoms, including Holding the Fort and Sink or Swim, as well as appearing in dramatic roles. In 1981, Davison signed a contract to play the Doctor for three years, succeeding Tom Baker (the Fourth Doctor) and, at age 29, was at the time the youngest actor to have played the lead role, a record he retained for nearly thirty years until Matt Smith (the Eleventh Doctor) took the role in 2009 at age 26. Attracting such a high-profile actor as Davison was as much of a coup for the programme’s producers as getting the role was for him, but he did not renew his contract because he feared being typecast.Patrick Troughton (who had played the Second Doctor and whom Davison had watched on the programme as a teenager) had recommended to Davison that he leave the role after three years, and Davison followed his advice.The Fifth Doctor encountered many of the Doctor’s best-known adversaries, including the Daleks (in Resurrection of the Daleks) and the Cybermen (in Earthshock). In 2008, Davison spoke unfavourably of some of the writing for the series during his tenure, claiming: “There were some very suspect scripts we did, knocked off by TV writers who’d turn their hand to anything. Fair enough, but they weren’t science fiction fans. You do get the impression, both with the television series now and Big Finish, that they are fans of science fiction and that’s why they are doing those stories.” Interviewed in 2013, Davison stated that The Caves of Androzani, The Visitation and Earthshock were his favourite serials from his time on the series, and that Time-Flight was the biggest disappointment because of a lack of budget.In 1982, Davison had lent his name to two series of short stories published by Arrow. The two were Peter Davison’s Book of Alien Monsters and Peter Davison’s Book of Aliens which both featured a photograph of him on the cover. Davison did, in fact, return to play the Fifth Doctor in the 1993 multi-doctor charity special Dimensions in Time and in the 1997 video game Destiny of the Doctors (audio only). He continues to reprise the role in a series of audio plays by Big Finish Productions. He returned once again in “Time Crash”, a special episode written by Steven Moffat for Children in Need; in the episode, which aired on 16 November 2007, the Fifth Doctor met the Tenth Doctor, played by future son-in-law David Tennant. Tennant later presented a documentary, Come in Number Five, which examined Davison’s Doctor Who years in some detail, and which was included as a special feature on the 2011 DVD re-release of Resurrection of the Daleks. It is one of many DVD releases of his Doctor Who serials in which Davison has appeared as an in-vision interviewee or in DVD commentary recordings.In 2012, Davison expressed further interest in returning to the role of the Doctor for the series’ 50th anniversary,but he did not take part. He did, however, write and direct The Five(ish) Doctors Reboot, an affectionate and comedic account of Colin Baker, Sylvester McCoy and himself attempting to get parts in the Anniversary Special, featuring cameos from numerous Doctor Who cast, crew, and famous fans. After Davison left Doctor Who in 1984, he immediately landed a role in “Anna of the Five Towns,” a period drama. In 1985, he appeared in the television movies “Miss Marple Mysteries: A Pocketful of Rye,” an “All Creatures Great and Small” Christmas special, and a feature-length episode of the American show Magnum, P.I. (“Deja Vu”.Davison did not work on another full television series until 1986, when he played Dr Stephen Daker, the hero of A Very Peculiar Practice, written by Andrew Davies. The black comedy-drama ran for two series (the latter was in 1988) and had a sequel with A Very Polish Practice, a television film. Davison played Tristan Farnon again in two more series in 1988 and 1990, but largely sat out two series of “All Creatures” that aired in between in order to play the lead in Campion, a series based on the period whodunnits of Margery Allingham. Davison’s next lead television roles were in the TV movie Harnessing Peacocks (1992) and the sitcoms Fiddlers Three (1991) and Ain’t Misbehavin'(1993 and 1995). In 1995, Davison presented Heavenly Bodies a six-part series about astronomy broadcast on BBC1. This led to him being featured on the cover of Practical Astronomy magazine. It was not until 2000 that he returned in another major role, that of David Braithwaite in At Home with the Braithwaites. During convention appearances in 2013, Davison cited this as his favorite among the roles he has played. Davison has appeared in several radio series including Change at Oglethorpe in 1995 and Minor Adjustment in 1996. In 1985 he appeared in the BBC Radio 4 comedy drama series King Street Junior, as teacher Eric Brown, but he left after only two series and was replaced by Karl Howman (as Philip Sims). In the 2000s, he starred in the comedy series Rigor Mortis. In 1992 he presented the video documentary release Doctor Who: Daleks – The Early Years, showcasing surviving episodes of missing stories featuring the Daleks.In 1994 he provided the voice of Mole in the The Wind in the Willows animated special Mole’s Christmas. He also played a doctor in Heartbeat episode “A Bird in the Hand”. In 1997 Peter Davison acted the part Buttons in the pantomime Cinderella in the Arts Theatre in Cambridge.1998 he guest starred in the sixth episode of the crime drama Jonathan Creek as the son-in-law of a horror writer who was shot dead on Halloween.In 1999 he appeared as the outgoing head teacher in the television series Hope and Glory, and had the recurring role of Inspector Christmas in several episodes of the 1999 series of Diana Rigg’s Mrs Bradley Mysteries.He has also starred in the television series as Dangerous Davies in The Last Detective (2003–2007) and Distant Shores (2005), both for ITV, in the latter of which he also played a doctor. In 2006 he appeared as Professor George Huntley in The Complete Guide to Parenting. He has also appeared on the TV series Hardware as himself. Davison made a guest appearance in the first episode of the second series of the BBC Radio 4 science fiction comedy series Nebulous, broadcast in April 2006. The sinking of the RMS Titanic occurred on the night of 14 April 1912 when she struck an iceberg at 23:40 (ship’s time) on Sunday, 14 April and sank two hours and forty minutes later at 02:20 (05:18 GMT) on Monday, 15 April, , in the north Atlantic Ocean, four days into her maiden voyage from Southampton to New York City resulting in the deaths of 1,514 people. The ice conditions at the time were attributed to a mild winter which caused large numbers of icebergs to break away from the west coast of Greenland. In addition, it is now known that in January 1912, the Moon came closer to the Earth than at any time in the previous 1,400 years, at the same time as the Earth made its closest annual approach to the Sun. This caused exceptionally high tides that may have resulted in a larger number of icebergs than usual reaching the shipping lanes a few months later. At the time of her entry into service on 2 April 1912, RMS Titanic was the largest ship in the world and had an estimated 2,224 people on board when she began her maiden voyage shortly after noon on 10 April 1912. Commanded by 62-year-old Captain Edward John Smith, the most senior of the White Star Line’s captains, she left Southampton on the first leg of her journey to New York. A few hours later she reached Cherbourg in France where she took on more passengers. Her next port of call was Queenstown (now Cobh) in Ireland, which she reached around midday on 11 April. She left in the afternoon after taking on more passengers and stores. Her passenger accommodation was said to be “of unrivalled extent and magnificence”. First Class accommodation included the most expensive seagoing real estate ever, with promenade suites costing $4,350 ($104,760 at 2012 prices) for a one-way passage. Even Third Class was unusually comfortable by contemporary standards and was supplied with plentiful quantities of good food, providing its passengers with better conditions than many of them had experienced at home. Her passengers ranged from millionaires such as John Jacob Astor and Benjamin Guggenheim, to poor emigrants from countries as disparate as Armenia, Ireland, Italy, Sweden, Syria and Russia seeking a new life in America. Despite radio operators receiving several warnings of sea ice during 14th April, Titanic was travelling near her maximum speed in waters where ice had been reported when she collided with the iceberg and . The ship suffered a glancing blow that buckled her starboard side and opened five of her sixteen compartments to the sea. 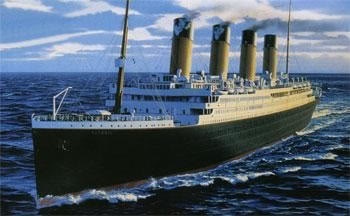 Titanic had been designed to stay afloat with four flooded compartments but not five, and the crew soon realised that the ship was going to sink. They used rocket flares and radio (“wireless”) messages to attract help as the passengers were put into lifeboats. However, there were far too few lifeboats available and many were not filled to their capacity due to a poorly managed evacuation. The ship broke up as she sank with over a thousand passengers and crew members still aboard. Almost all those who jumped or fell into the water died from hypothermia within minutes. RMS Carpathia arrived on the scene about an hour and a half after the sinking and had rescued the last of the survivors in the lifeboats by 09:15 on 15 April, little more than 24 hours after Titanic’s crew had received their first warnings of drifting ice. The disaster caused widespread public outrage over the lack of lifeboats, lax shipping regulations, and the unequal treatment of the different passenger classes aboard the ship made it one of the worst maritime disasters in history. Enquiries set up in the wake of the disaster recommended sweeping changes to maritime regulations. This led in 1914 to the establishment of the International Convention for the Safety of Life at Sea (SOLAS), which still governs maritime safety today. British guitarist and songwriter Richard “Ritchie” Blackmore was born 14 April in 1945. He was one of the first guitarists to fuse classical music elements with blues rock. He began his professional career as a studio session musician and was subsequently a member of Deep Purple, after which Blackmore established a successful career fronting his own band Rainbow, and later progressed to the traditional folk rock project Blackmore’s Night. Blackmore joined the rock group Deep Purple in 1968 after receiving the invitation from Jon Lord (organs). The band had a hit US single with its remake of the Joe South song “Hush”. Purple’s early sound leaned on psychedelia and progressive rock This line-up produced three studio albums. The second line-up’s first studio album, In Rock, changed the band’s style, turning it in a hard rock direction. This “Mark Two” line-up featuring singer Ian Gillan lasted until mid-1973, produced four studio albums and had their well-known hit single “Smoke on the Water”.The third line-up’s new album was entitled Burn, which featured blues singer, David Coverdale. This “Mark Three” line-up lasted until mid-1975 and produced two studio albums. Blackmore publicly disliked the funky soul influences that Coverdale and bassist/vocalist Glenn Hughes injected into the band. Following its conclusion, he abandoned the band to front a new group, Rainbow. Blackmore originally planned to make a solo album, but instead in 1975 formed his own band Ritchie Blackmore’s Rainbow, later shortened to Rainbow. Featuring American vocalist Ronnie James Dio and his blues rock band Elf as session musicians, this first line-up never performed live. Rainbow’s music was partly inspired by classical music since Blackmore started playing cello to help him construct interesting chord progressions in private time. The band’s debut album, Ritchie Blackmore’s Rainbow, was released in 1975. Blackmore had been impressed by Dio’s relatively flexible vocalist-style. Shortly after the first album was recorded, former Elf members except Dio were at that point no longer members of Rainbow, and Blackmore recruited a new lineup to record the second album Rising, and the following live album, On Stage. 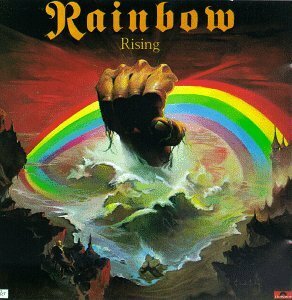 Rising was originally billed as Blackmore’s Rainbow in the US. After the next studio album’s release and supporting tour, Ronnie James Dio left Rainbow due to “creative differences” with Blackmore, who disliked Dio’s signature ‘Dungeons & Dragons’ lyric style. Blackmore continued with Rainbow and the band released a new album entitled Down To Earth, which featured R&B singer Graham Bonnet. The album marked the commercialization of the band’s sound, and contained Rainbow’s first chart successes, as the single “Since You Been Gone” (a cover of the Russ Ballard penned tune) became a smash hit. Bonnet left the band after this support tour. The next album, Difficult to Cure, introduced American vocalist Joe Lynn Turner. The instrumental title track from this album was an arrangement of Beethoven’s Ninth Symphony with additional music, a personal favourite of Blackmore’s. The album marked the further commercialization of the band’s sound with Blackmore once describing at the time liking for the pop rock band, Foreigner. Hard rock-based fans thought the vocal parts ended up being a bit too melodic than Rainbow’s previous releases. The music was consciously radio-targeted, in a more AOR style, resulting in some degree of alienation with many of their earlier fans. Rainbow’s next studio album was Straight Between the Eyes and included the hit single “Stone Cold.” It would be followed by the album Bent Out of Shape, which featured the single “Street Of Dreams”. In 1983 Blackmore was also nominated for a Grammy Award for his work on an instrumental ballard track, “Anybody There”. Rainbow disbanded in 1984. A then-final Rainbow album, Finyl Vinyl, was patched together from live tracks and the “B” sides of various singles. In 1984, Blackmore joined a reunion of Deep Purple featuring singer Ian Gillan and recorded new material. This reunion line-up lasted until 1989 and produced two studio albums. The next line-up recorded one album entitled Slaves & Masters, which featured former Rainbow vocalist Joe Lynn Turner. The album’s style differed from the traditional Purple sound. Subsequently the “Mark Two” line-up reunited for a second time in late 1992 and produced one studio album. During its follow-up promotional tour, Blackmore again left the band in November 1993. Blackmore reformed Rainbow with new members in 1994. This Rainbow line-up, featuring Scottish singer Doogie White, lasted until 1997 and produced Stranger in Us All in 1995. It was originally intended to be a solo album but due to the record company pressures the record was billed as Ritchie Blackmore’s Rainbow. Released in the post-grunge mid-1990s, a relatively successful world tour followed. Though White was not as distinctive as its previous singers, with a style comfortably sitting somewhere between the neo-classical metal and the radio friendly commerciality, Stranger In Us All had a sound dissimilar to any Rainbow of old. This is regarded as his last hard rock album. Rainbow was put on hold once again after playing its final concert in 1997. Over the years Rainbow went through many personnel changes with no two studio albums featuring the same line-up: Blackmore was the sole constant band member. In 1997 Blackmore, with his girlfriend Candice Night as vocalist, formed the traditional folk rock duo Blackmore’s Night. Around the same time as production of Stranger in Us All, they were already gearing up their debut album Shadow of the Moon. Though she lacked experience as a lead singer, Blackmore noticed Night’s potential and encouraged her to become his creative partner. Blackmore described their sound as “Mike Oldfield plus Enya” Blackmore mostly utilised acoustic guitar, to back Night’s delicate vocals. During song composition, Blackmore usually wrote her vocal melodies. The band’s musical style is inspired by his favorite Renaissance music and blends with Night’s lyrics about medieval themes and fantasy. They recorded a mixture of original and cover materials. Blackmore’s Night was originally thought to be a one-off collaboration, but has endured as an ongoing band project with a series of album releases and tours. The second release, entitled Under a Violet Moon continued in the same folk-rock style, with Night’s vocals remaining a prominent feature of the band’s style. Blackmore was ranked number 16 on Guitar World’s “100 Greatest Metal Guitarists of All Time” in 2004, and number 50 in Rolling Stone magazine’s list of the “100 Greatest Guitarists of All Time” in 2011. In 1965 Anderson created Stingray, featuring the underwater exploits of Troy Tempest and his submarine, and the first of his series to be shot in colour. The series was also the first of Anderson’s to be sold to America. Anderson’s most successful and popular series Thunderbirds was elaborately produced and followed the adventures of the futuristic Tracy family who ran an air, space and undersea rescue service from a small island in the Pacific. Anderson remembered that his elder brother, Lionel, a pilot who was killed in the war, had trained in Arizona near Thunderbird Field, and helped himself to the “very exciting” name. As well as Jeff Tracy and his sons John, Scott, Virgil, Alan and Gordon (all named after early American astronauts), Thunderbirds also introduced some of Anderson’s most popular and enduring characters, including the myopic genius Brains, the glamorous secret agent Lady Penelope ( who was based on his second wife, Sylvia) and her chauffeur, an ex-alcoholic Cockney safecracker-made-good called Parker, whose distinctive way of speaking (“Yus, m’lady”) was apparently modelled on a waiter at a pub in Cookham where Anderson used to have his lunch.Although the television series caught the imagination of millions of young viewers, two feature-length film spin-offs, Thunderbirds Are Go and Thunderbirds 6, both failed to achieve the same popularity. More successful was Anderson’s venture into a tie-in weekly children’s comic, TV Century 21, launched in 1965 and containing strips based on his various television series. In 1967 Anderson created a new series, Captain Scarlet, named after its indestructible hero, and the first to be made by Anderson’s new production company, Century 21. It was followed in 1968 by Joe 90, about a nine-year-old boy who gained expert knowledge on any subject using his uncle’s hi-tech mousetrap invention. Anderson’s next venture, The Secret Service, was his first and unsuccessful attempt to combine puppets with real actors and marked the start of a decline in the fortunes of his production company, Century 21.His first science-fiction feature film, Journey to the Far Side of the Sun, starred Ian Hendry and Patrick Wymark and coincided with Anderson’s first all-live action series for television called UFO which, although well produced, was a humourless affair which failed to make an impact on its first showing – while attracting considerable interest when it was repeated in 1987. In the 1970s Anderson persevered with live action series such as The Protectors, featuring a glamorous international crime-fighting agency starring Robert Vaughn and Nyree Dawn Porter, and Space 1999, a sub-Star Trek enterprise which was critically panned for its stereotyped characters and bland scripts. Stalled projects, misjudged investments and a property crash left Anderson in dire financial straits, and he endured a painful divorce from his second wife and former business partner, Sylvia.